Any fool can make it. When given as a gift, the recipient will be fooled into thinking you worked all day in the kitchen. You’re only fooling yourself if you think you can enjoy just one piece! All speculation aside, the truth is there is no dish easier to prepare for your own enjoyment or shared with others. 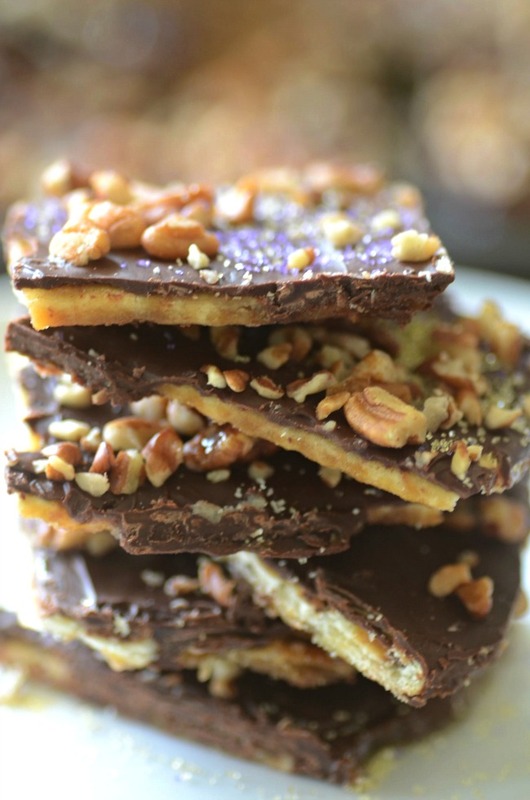 The only way to go wrong with this delectable treat is to make a single batch! Line a 10×17-inch baking pan with foil and coat the foil with butter. Arrange the crackers in a single layer with sides touching in the prepared pan. Combine 1 cup butter and brown sugar in a saucepan. Bring to a boil over medium heat, stirring constantly. Boil for 4 minutes, stirring constantly. Pour the butter mixture over the crackers. Using a wooden spoon, spread the mixture evenly over the crackers. Bake at 350 degrees for 5 minutes. Sprinkle with chocolate chips and let stand for 2 minutes or until the chocolate chips soften. Spread the chocolate evenly over the prepared layers using a knife or metal cake spatula. Sprinkle with the pecans and press lightly. Chill for 30 minutes or until set. Break into pieces and store in a covered container in the refrigerator. Serves 8 to 12.